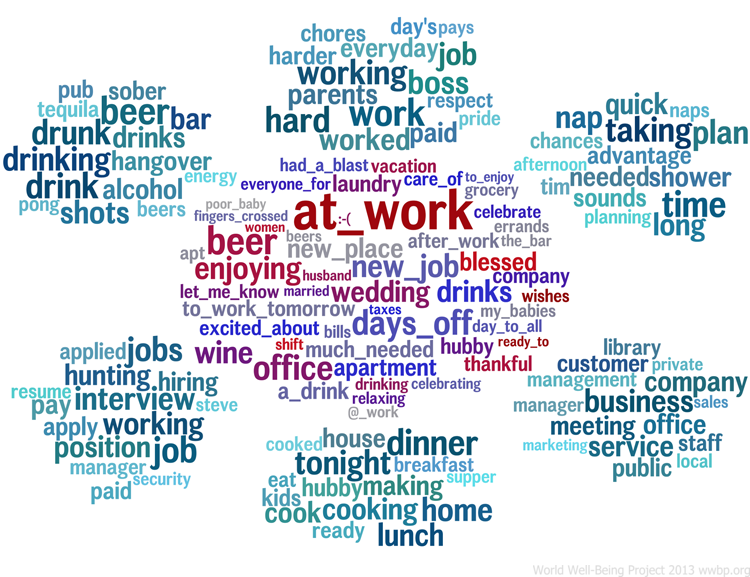 Word clouds were grouped by the “Big Five” personality traits, which have been studied and documented in personality tests: Extraversion, Agreeableness, Contentiousness, Neuroticism, and Openness (see the World Well-Being site for further explanations); these were further categorized by gender and age group. The researchers found that college-aged students (ages 19-22), for example, used words and phrases such as “semester,” “campus” and “in_the_library,” versus the post-college group (ages 23-29), who used phrases like “at_work,” “new_job,” “library” (we’re glad the post-college folks are still referencing the library!). 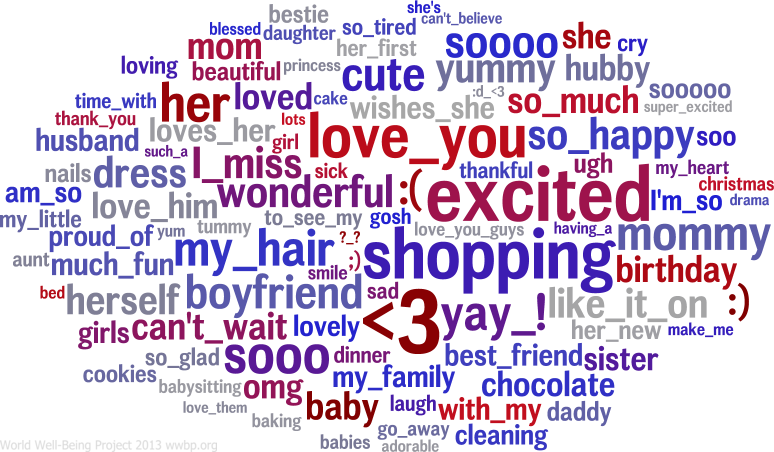 The discussion became very animated as everyone tried to analyze their own age group and gender based on the word clouds! Ages 22-29 word cloud. Image courtesy of the World Well-Being Project. Overall, the project is fascinating. The researchers brought up some larger take-away points that can guide how we help students explore digital tools and social media networks. 1. The importance of collaboration and networking on small and large scales. On a smaller scale — here at WIC, or in our own groups of Twitter followers or Facebook friends — how can we help to change these trends in word usage? In other words, can viewing more status updates geared toward the “openness” personality type help someone in the “neurotic” type to gain a new outlook? On a larger scale (region-wide, nationwide, worldwide), can researchers use this data in accordance with census information to track how emotions differ and change across regions? The researchers at the DH Forum spoke about the importance of geotagging in tweets and Facebook posts and correlating this with Gallup Polls, for example, as a way to discover how certain populations are feeling and responding to events. 2. The importance of collaboration among departments across campus. Not only between Computer Science and Psychology, as shown in this project, but also more generally, between technology experts and humanities scholars. For example, at WIC, we like to think that we help bridge this gap, by providing “tech” help and expertise to various faculty and students working on projects, from the humanities, to engineering, to health sciences (see my post on the Digital Humanities and WIC’s role). This type of collaboration will become crucial as scholars, especially in the humanities, increasingly utilize technology to enhance their teaching and research. 3. The library’s role in data collection. As more and more DH projects arise, libraries have become an essential repository for the curation of and access to large amounts of electronic data. More importantly, libraries can serve as the nexus for data-sharing among campus departments and groups working on such collaborative DH projects. Stay tuned for more DH Forum events this spring, and be sure to check out the World Well-Being site for more information on this exciting project.